Harman Kardon reveals Citation Series home cinema speaker system with Google Assistant | What Hi-Fi? Hot on the heels of the launch of the Citation 500 smart speaker, Harman Kardon has revealed an entire AV speaker range with smart streaming features. Combining its 65 years of home audio expertise with the latest smart technologies such as voice control, multi-room streaming and more, Harman Kardon claims its Citation Series represents “the next generation of home speakers”. It’s a stylish and feature-packed line-up consisting of eight products: four smart wireless speakers, a pair of smart floorstanding speakers, two surround speakers, a smart soundbar and a subwoofer. This gives users the scope to use the speakers individually or as part of a 5.1 surround speaker system. All Citation speakers feature Google Assistant voice control, multi-room streaming and hi-res audio playback up to 24-bit/96kHz thanks to Chromecast built-in. That means you can play music from streaming services such as Tidal and your home media library, or cast videos and tunes over wi-fi. AirPlay 2 support is coming soon, too. 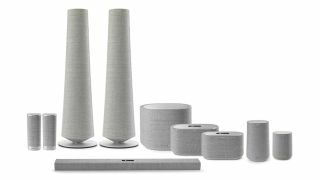 The products are elegantly clothed in dirt repellant and flame retardant wool fabric sourced from leading Danish acoustic textile manufacturer Kvadrat (who has also clothed multiple Bang & Olufsen speakers) and come in winter grey or classic black finishes. Rounding up the AV experience is Harman Kardon’s Enchant series of soundbars. The Enchant 1300 is a 13-channel soundbar with three HDMI inputs, Bluetooth and wi-fi. The smaller Enchant 800 soundbar features eight channels and one HDMI input, while the Enchant Subwoofer packs 400W of power. Both soundbars feature Harman Kardon’s MultiBeam technology: a digital processing algorithm that delivers a surround sound experience without needing extra speakers. It uses side-firing transducers that beam sound off walls, while a new Automatic MultiBeam Calibration tailors the sound to your room’s dimensions. Both soundbars feature Chromecast built-in, HDMI ARC outputs, and support multi-room streaming, 4K and HDR10 passthrough. Available in Autumn 2018, the Enchant 1300 and Enchant 800 soundbars will cost £900 and £620 respectively, while the subwoofer costs an additional £620.